GC-100 is the best solution if you don’t have media director near A/V equipment. In that case you can use it to send IR commands over LAN and then transmit them via IR sensors. 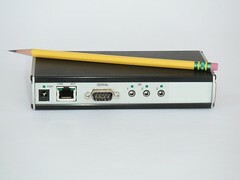 Moreover, GC-100 includes one or more RS-232 and relay ports. The rest devices can just transmit IR signals. They are good if you need to control your TV from the media director. In my installation I’m going to control receiver Marantz 5600 placed in separate audio zone via GC-100 using its RS-232 port. Use instructions from wiki to know how to add Marantz to the Plutohome and how to configure GC-100. P. S. Those devices can be used the same manner in LinuxMCE as well. Recently I got GC100 in my hand to test it with Plutohome. By default GC100 has IP 192.168.1.70. So, that howto suggests to connect it to the PC using crossover, change IP of PC to something like 192.168.1.101 to be in one network and access to the GC100 properties via web interface – http://192.168.1.70. So, I followed by that recommendations. I changed IP of GC100 to 192.168.80.250 and exclude it from DHCP range. After that I put CG100 into Pluthome network and tried to add it but without luck. It seems that devices is not accessible by some reason. I even couldn’t ping it. Well, after that I tried another way to install GC100. I discovered that core has virtual interface eth1:100 which builds network 192.168.1. * for GC100. I reset my device to factory settings (it can be done by connecting pins 7 and 2 on connector serial 1 with a flat bladed screw driver during power up) and let to Pluto discover it. But unfortunately, again without luck. I saw in tcpdump output that Pluto asked GC100 by its factory IP three times but devices didn’t answer by some reason. I connected GC100 to my Pluthome core using crossover. So, it should work but it doesn’t.